Hadoop, identified as an up-to-the-minute architecture for Big Data Analytics seamlessly integrates with; and adds more value to a company’s existing Business Intelligence (BI) systems. Hadoop has proved itself over the years, and has moved up the ladder to become a multi-application processing tool for webscale and enterprise users. Earlier, it was only identified as a batch-oriented analytics tool used by a few webscalers. Hadoop is synonymous to Big Data. It has been one of the most sought after tools for handling Big Data, but the evolving technology demands more variety. Also, Hadoop is a relatively complex software, and hence, the intricacy is giving rise to the demand for an easy to use software. Though, it is more preferred by the large scale companies, as it has the capability to handle large scale data analytics. However, small and medium enterprises are also looking for Hadoop Consulting Services alternatives. A requirement for a real-time applications can also be one of the reasons of people moving to other alternatives. Presto is one of the top big data analytics tool at the moment. Presto is a relatively new interactive query system. It is known to operate fast at petabyte scale that is centered on a distributed SQL query engine. It is optimized for ad-hoc analysis at interactive speed. All processing of data is executed in the memory. Presto is quickly becoming a preferred choice of the data scientists as it has proven its caliber in the past few years. Presto allows querying data where it is founded like Hive, Cassandra or even relational databases and exclusive data stores. One thing that makes Presto a preferred choice is the fact that one query in Presto has the capability to amalgamate data from several sources. And, this feature allows efficient data analytics across the entire business. The tool is conceptualized to cater to the needs of the data scientist who expect a response times starting from sub-second to minutes. Presto is a breakthrough product which is not extensively expensive, and doesn’t even require excessive hardware to support its functions. A MapReduce implementation, Presto has the capacity to concomitantly use a plenty of data stores as sources. Spark is a tool that has the power to conglomerate the analysis of recorded data in batch mode with the data entering the tool in real time. You must be wondering how the software meets the real time processing speed. It maintains the speed by aggressively keeping data only in the processing node memory. Spark offers an interface for programming entire bunches with imbedded data parallelism and fault-tolerance. Saved from the limitations of HDFS, Spark uses a varied range of data stores as sources and depositories. And, these data sources can also be utilized as independently functioning analytics tools in detached mode. Plus, it doesn’t have any dependency on Hadoop. Spark was developed at the University of California but the codebase of the tool was later given to the Apache Software Foundation. An economically priced, petabyte scale, Google’s fully managed enterprise data warehouse for analytics, Google BigQuery is quickly becoming a top choice of the data scientists. It is a favorite of many, and is being used in many small, medium and even large scale organizations. The best part about BigQuery is that you do not require any infrastructure or a database administrator to manage this software. The tools enables the users to channelize their energies in only finding meaningful and useful data insights through the familiar SQL, as it doesn’t demand much maintenance. One of the top qualities which make this data analytics tool a top favorite is the fact that it is Serverless. So, without spending time and money on operating and sizing computing resources the user can make the full use of the analytics software. Another thing that makes it a perfect alternative of Hadoop is its extremely high-speed streaming insertion API. The API offers a solid base for real-time data analytics, which is the need of the hour! This real-time data analytics comes handy in curating latest business plans. The main reason why people would like to move to a Hadoop alternative is the need of real time data. 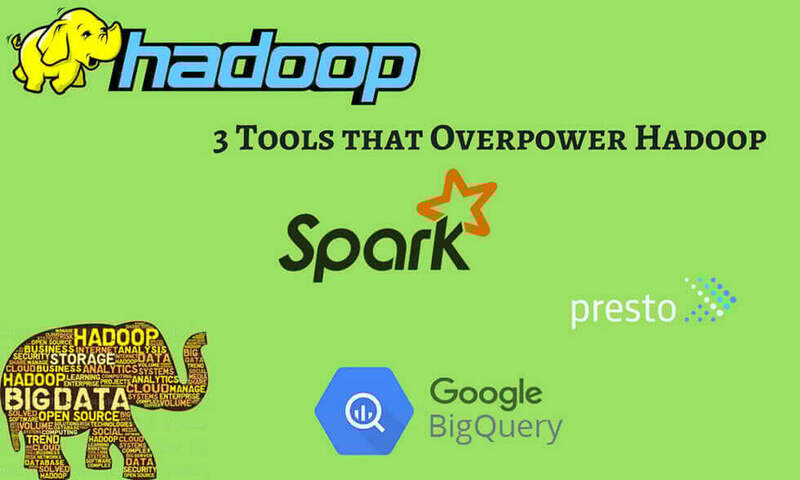 And, many of the latest Big Data analytical tools have an edge over Hadoop as they offer real time data analysis and that too at a large scale. Though, with the rapid increase in the demand of Big Data analytics, we are sure that the technology surrounding Big Data will keep evolving! How Big Data Beneficial for Advertisement?